Ari, I look forward to your courses. My issue is freedom while playing grooves. When you have a reasonable understanding of theory as a beginner intermediate player, it’s all about putting it into use. Here’s a perfect example. The song James by Pat Metheney. So it’s a repetitive chord progression and I can play it, use some fills and runs to make it interesting and actually make it work in a live setting. (albeit at a low level but listenable). Now listen to it played live with Christian McBride. Now don’t get me wrong, I understand who Christian McBride is but he simply plays within those chords but puts in a lot more information. So what practice routines should we do to learn to put more of that theory into our grooves, (not interested in soloing, just good grooves). That is what I call Freedom when the you can recall information and make grooves interesting. All the best and love your spots on Scotts bass lessons as well. Thanks for checking in! Tom had been kind enough to fill out my survey a while back. My survey revealed that one of the most burning requests the readers of my blog are having is to play with more freedom. Tom responded to my request for further clarification and wishes on optimizing my materials. The tune he talks about is here if you want to take a look and listen. One can get free and creative pretty much right away. Matter of fact I do that with beginner students in my first lesson. Depending on how their fingers and coordination feel, I may bring in one or two notes or a simple box shape and I help them “go to town” with that. We restrict the tonal material and we do it in a way that is technically simple. Nothing big musically, true, but something VERY big happens when you give it a go: the student is able to access their free/creative pool. It is a natural part of being a human, the playful, communication thing. I think it is incredibly crucial to allow access to that part of oneself. So often people do not even know they have it, and too many times they plague themselves with notions of how great others sound, or that the simple playful thing they are doing there has no validity. I strongly contest that because it taps into your muscle as a musician, as the person YOU are, and it is tasting freedom. Don’t judge it for its technical or music theory complexity, accept it as the palette that you as a person have meeting the musical palette you are learning here. Good technique! Crucial for good tone, a head-boppin’ groove, good phrasing, great dynamics etc etc. Note choices – be comfortable with the fretboard (my private students will chuckle here, as I always talk them into doing my Pattern System, which really nails fretboard knowledge); you want to be completely comfortable with knowing in advance how the notes of a certain musical constellation sound like, what these shapes feel like under your fingers and of course their sound in relationship to the chords. Theory! The better you understand chords, sounds, structures, the more options at your disposal. A big part of that is ear training of course! Interaction! Listen how the players interact with each other. What specifically does the bass player do, when while different soloists are playing? Their business or lack thereof (I call it “density”), how do they use silence, interact dynamically? How are instruments using their range for effect and interaction? Rhythm! Practice grooves first and know where in the bar you are at all times. Then add variations to the rhythm, still being aware of where you are rhythmically. Next add some fills, but stay within the bar, meaning hit the downbeat of the next bar returning to the groove you play. Then expand from there – make your variations or fills longer, go over the bar line, make them 2 or more bars long. Always remember to keep it appropriate for the style and arrangement you are performing in. Just like finding the right notes, this can be practiced systematically and is part of my teaching program. Also accept, that this is part of a never ending journey. I have never met Christian, but I have talked to many of my heroes about this and they would all agree with that notion that the exploration of that palette never is “completed”. one is the focused approach: transcribe a bit of Christian’s lines. Then analyze – note choices, rhythm, vocabulary, dynamics, interaction with the band etc. the other approach is the diffuse approach – immerse yourself, listen to his lines over and over. Sing them. Feel into the emotional quality and the flow of energy. If your technique is strong and you know your theory and fretboard really well, the lines will start coming out naturally, flavored by your hero’s sounds. If you are interested in more about these two learning approaches, I recommend a fantastic (and free) course by Barbara Oakley on Coursera: it is called: Learning How to Learn: Powerful mental tools to help you master tough subjects. My methods are influenced by Barbara’s research and recommendations. 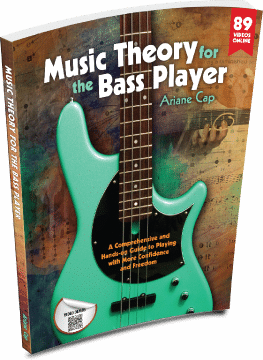 My upcoming course “Music Theory for the Bass Player – The Course” surely will address all these bullet points of the musical palette. If you are interested in going on this journey with direction and a system, and haven’t signed up yet: Get Early Bird Info! There is something magical, cool, relaxing and flowing, even spiritual, if you will, that happens when our mind is free to access creativity rather than to be fishing for notes and struggling technically. Create a good foundation and let the rest happen! A lot of times, my playing isn’t so much going over the wall as trying to go through it. IT is a lot harder, true, at least initially, but once you’ve had the breakthrough, it gets a lot easier to get to the other side.Finding the pocket, being in sync with the others in the rhythm section, being aware. Hans, yeah, going for it, mistakes and all! Diatonics, yes!! Great to hear. I took your advice on the Barbara Oakley Course, excellent tip thank you. With that in mind, you are saying that we practice in the Focus Mode and perform in Diffuse Mode? Or should there be an overlap of the two, how would this work in a performance situation where you are sight-reading? Great question, Nick. Let me think about that one a little bit and als sit with Barbara’s course a bit more. I think when you are in a performance situation you want to be relaxed but definitely focused. The diffuse mode seems to work best as a state after practicing to let the learned material percolate and simmer.